“No idea is a good idea unless it first appears to be completely illusory.” (Albert Einstein) Español. Now, as we witness a Greek tragedy and an unbelievable failure of European politics, which will trigger further tendencies of disintegration and renationalising attitudes across Europe, it is more important than ever to sketch out a bold idea of what Europe, in principle, should look like in the twenty first century – if it is to get itself out of the mess of this crisis. We should remember these days, that the real enemies of Europe are not the Greeks; our enemies are outside Europe, awaiting the unravelling of Europe's richness and precious set of values, in order to buy it off or take it over on the cheap. The argument that follows attempts to profoundly re-think, re-design and re-build Europe on a fundamentally different basis, in order to scale it up to a truly modern & post-national political entity, able to confront the challenges of the 21st Century. We submit this idea here at openDemocracy for European-wide discussion, to be of some service to the moment when Europe will decide to move out of this vicious, self-mutilating circle it is now in, able and willing to do a profound reset and take a fresh start. Europe has to change drastically to be fit for the twenty first century. It has to transform into a European Republic, based on the principle of political equality between all European citizens. Here, we sketch out our vision of a “Network-Europe 21”, where regions and metropolitan areas become the constitutive hubs of a European Republic. A new vision for a Europe of the future. At this politically unique point in time, Europe’s emancipation from the past but especially from close-minded short-sightedness is essential to overcome the nation-state-based discourse of today’s crisis-Europe. The harbingers of the dangers that come with a re-nationalisation of the political realm, and the debate on Europe, are already tangible and visible: Brexit, populism, and a migration discussion beyond fact-bound reasoning. That is to name only three examples. Sadly, each of these are very complex, intertwined, and thus reason enough for many citizens to not question the simple answers that are available. Yet, some people do make the effort. 5 young Europeans, all born after 1980, have come up with a starting point to what “change” should include. They have published their call, “Europe: A new version is available” online at www.european-republic.eu and are seeking to gather a critical mass over several months that shows Europe’s citizens worry about what is happening at the moment and equally care about Europe’s joint future. The current EU offers equality for markets and for companies, but not for citizens. This should and even must be inversed eventually: each and every political entity must secure political equality for its entire people; whereas companies are out there to compete. That is their role, but citizens are not here to compete against each other through tax or social regimes. We thus need to de-construct the current language which governs discussion in and about Europe. The buzzwords with which the current euro-crisis is negotiated today are: governance, integration, structural reforms, growth, competitiveness, subsidiarity. All these words refer to unclear political concepts that need rigorous debate for agreement. None of these words offers an emotional connection; none of these words contains any normative grounding; none of these words creates a vision for Europe or unites its citizens behind a common good and a common goal. The existing EU system is the embodiment of post-democracy, or as Colin Crouch put it: “You can always vote, but you have no choice”. Anyone who opposes the current politics of the EU, opposes the system itself. This is starkly demonstrated in negotiations with the Greek government. We have become so lost on our path towards Europe that we now find ourselves in a dilemma: under the current democratic conditions, the European system cannot generate the solutions we need to make the single market a political sphere, with a democratic and social framework for the people living here. We cannot imagine a future without Europe, living in this unclear and ever-evolving Europe. Or at least this is how it used to be. Somehow this Europe, this EU, has reached its end. It is exhausted, incapable of reform and no longer capable of achieving majority support. The EU seems to be a dying political model – a model which some are now protesting fiercely against. Politicians, analysts, and citizens have begun to picture a Europe without Greece. Or without the United Kingdom. Or without Hungary. Less than 50% of European citizens are happy with European democracy in its current form. What is to be done in this quasi-Hegelian moment, when a system is exhausted, and simultaneously lacking the power to reform? First, we need to stop discussing the EU and its member states in a vertical manner: “More or less Europe?” a notoriously famous question, illustrating a misleading perspective. There is no question about further integration; for the Eurozone is almost completely integrated in economic and monetary terms. European integration is yesterday’s word; tomorrow’s is European democracy. While markets were integrated to remove the economic obstacles in nation-bound structures, political and social integration was and is neglected. While European freedom of movement has created vast flexibility as to how and where Europeans live their lives, election systems, tax systems, social security systems based on national boarders remain inflexible. To the degree that they become a burden to European citizens. A transnational European democracy is needed. One that goes beyond nation states so that the people of Europe can live as European citizens. 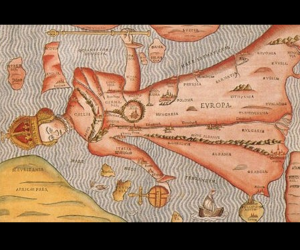 If we look at the map of Europe of 1537, this is what we see: a female body under which and in which each and every monarchy or “nation” or region or people or ethnicity finds its natural and organic place. The symbolism of this map tells us that everybody has place and space – and even a specific function – in the organic body of Europe. Here, a megatrend of European history reveals itself: regions and metropolitan areas, wanting to be more independent. These metropolitan areas, embedded in their surrounding regions, could be the connecting hubs of a “Network Europe 21”. Second, we need to give Europe to its citizens. 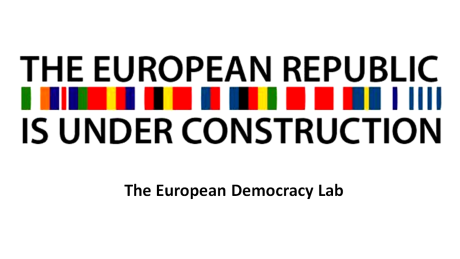 A Europe of the future needs two things: a common republican roof ensuring the political equality of all citizens; and a network of autonomous regions and metropolitan areas. Political equality means three things: equal voting rights; equal taxation of citizens (income tax, property tax); equal access to social rights (meaning European health care and European unemployment assurance). The French revolution brought equality for all European citizens beyond classes. Today, Europe’s – peaceful! - revolution of minds must ensure political equality beyond nation states. The necessary economic buffers and competition between regions will arise through the use of regional taxes. The good news is that the vast majority of European citizens intuitively accept and live the principle of political equality. In this respect, the general population is ahead of the political elite, which currently seem to be trying hard to respond to populist pressure: it is a shame, then, that no political party in Europe has so far adopted the explicit goal of political equality for all European citizens. The republican European political entity of “Network-Europe 21” could model the US’s political system: next to a pro rata European parliament would stand a European congress composed by two senators per region or metropolitan area, with each region/ metropolitan area having a governor. This would be compatible with the direct election of a European president, which is in many party programmes of European parties today – and which would constitute an in-depth identity building exercise for European citizens in the twenty first century. The notion of a Republic is an emotional one, as it refers to the public good. As vocal, emancipated European citizens, we hold the new political order in our hands at all times, for we are the sovereign. We do not need to do and achieve all this now. But we need to re-think, re-design and re-build Europe in a different way. The first step is to put our aims on paper and turn it into a political claim!